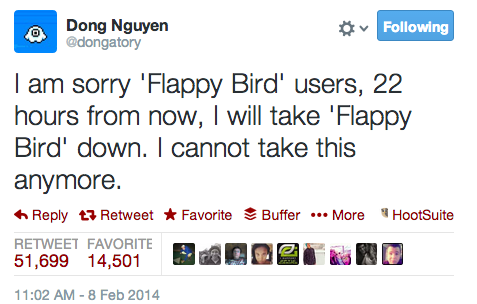 Flappy Bird Creator Says He’s Taking the Game Down Tomorrow–Why? In a shocking turn of events, the creator of Flappy Bird has announced on Twitter he will be removing his game from the App Store tomorrow. The explanation is that the game is taking away from creator Dong Nguyen’s “simple life” and that he also will not be selling his game, which has amassed over 50 million iOS and Android downloads plus has recently been earning him over $50,000 per day. The news comes a day after the game received an update to its user interface and added new birds. 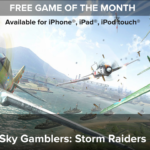 Ever since Flappy Bird became a viral hit, Carter Thomas from Blue Cloud Solutions, has long suspected the game was the result of something fishy (as we originally noted in our first piece on the game), whether it be bots pushing up its downloads or some other sort of scam. Given the sudden move by the app’s solo developer to remove his app after raking in all those ad revenues—was Thomas onto something? Members of the press have always wondered why the developer wanted to keep his private life quiet and refused interviews; could that be related to the fact the game have had its rankings cooked? Why take down a hugely profitable app? It doesn’t make sense at all. This announcement surely will result in another huge spike in last minute downloads–are we all being trolled right now? Click here to download Flappy Bird while you still can.